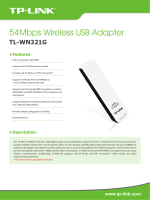 TP-LINK TECHNOLOGIES CO., LTD. Copyright © 2012 TP-LINK TECHNOLOGIES CO., LTD.
1) This device may not cause harmful interference. could void the user?s authority to operate the equipment. any other antenna or transmitter. This equipment has been SAR-evaluated for use in hand. in which case the user may be required to take adequate measures. Note: Please don?t use the product outdoors in France. between the radiator & your body. cm de distance entre la source de rayonnement et votre corps. ?? ????? ??? ???? ???? ??. Please verify that all the package contents below are available. damaged or missing, please contact your distributor. USB Adapter without any explanations. experience, such as downloading, gaming, video streaming. quickly set up a wireless connection. best choice for easily adding or upgrading wireless connectivity to your desktop. The adapter's radio has been disabled. Data is being transmitted or received. Plug the Adapter directly to the USB port on your computer. therefore here takes the procedures in Windows 7 for example. Guide. Click Install Driver&Utility to begin. The InstallShield Wizard window will appear. Click Next to continue. Configuration Utility and Driver. Selecting Install Driver Only will only install driver. Click Change to specify the destination location for the software or you can leave it default. Click Next in the screen below to continue. Click Install to continue the setup. The utility and drivers will install. This may take 1~2 minutes. After all the steps above, you will see the screen below. Click Finish to complete the setup. please refer to Chapter 3 Connect to a Wireless Network. connect to a wireless network using one of the following methods. access point supports QSS or WPS as is called by some other brands. operations, please go to to connect using Windows built-in wireless utility. icon in your system tray. connect to a network, simply highlight the wireless network name and click Connect. automatically connect to your target network next time if you tick Connect automatically. password to your router or access point. features the QSS/WPS function to quickly build a connection without having to enter a key. You have now successfully connected to your network. Click Close to enjoy the Internet. wireless card and router using either Push Button Configuration (PBC) method or PIN method. 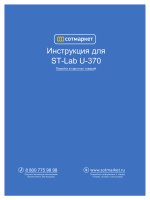 supported in Windows XP and Windows Vista. Push the WPS button on the Adapter. wireless router and then click Connect. The adapter will be connecting to the target network. When the following window appears, you have successfully connected to the network. Enter the PIN from your AP device. Enter a PIN into your AP device. Following are detailed configuration procedures of each way. please enter the new one instead. Click Connect to continue. When Figure 3-9 appears, you have successfully connected to the network. This method is only available in Windows XP and Windows Vista. which is randomly generated. Click Connect to continue. the empty field beside PIN and then click Connect. When Connect successfully appears on the screen, the WPS configuration is complete. successful as shown in Figure 3-15. Windows 7 users may use the built-in wireless utility. Follow the steps below. (displayed using the SSID) to be connected and then click Connect. secure, the connection will be built without entering a key. You have now successfully connected to the network. Windows Vista users may use the built-in wireless utility. Follow the steps below. as shown in the figure below. Select Connect to a network. network you would like to connect and then click Connect. connection will be built without entering a key. Windows XP users may use the built-in wireless utility. Follow the steps below. shown below. Click OK when Figure 3-25 appears to continue. (displayed using the SSID) and click the Connect button. not, you will connect to the network directly without entering a key. icon on your desktop will start the utility. section, the following page will appear. The following items can be found on the screen. name is not allowed. Please also note that no space is allowed between words. SSID: Select the target network from the drop-down list. WPA-PSK/WPA2-PSK uses a passphrase or key to authenticate your wireless connection. wireless router or access point before configuring your wireless adapter. as on your router or access point. Security Key: Enter the passphrase exactly as it is on your wireless router or access point. Click the Show characters box to see the passphrase. Unchecking it will hide it. Save: Click Save to save your settings. Connect button on the bottom of the window. To select wireless configuration tool. Windows wireless configuration tool. This option is available only in Windows XP. To switch to another wireless network adapter. are supported by this utility. To switch to SoftAP mode. To change the power save mode. The default option is OFF. The About screen gives you information about the Driver and Utility versions of the adapter. icon in your system tray and select About from the list. In Soft AP mode, the adapter will work as an AP. This function is available only in Windows7. wireless-capable devices to connect to it. following figure. Click OK when prompted to confirm the setting. The Soft AP icon should then appear beside Advanced icon in the utility. Soft AP mode: Select to enable or disable the function. to your AP can access the Internet. AP is yours when trying to connect to it. The default name (SSID) is ?SoftAP?. wireless connection. You needn?t make any configuration here. Encryption Type: The encryption type here is set to be AES. IP Address: Here displays the IP address of the SoftAP. 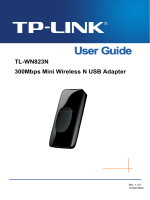 click Uninstall-TP-LINK Wireless Configuration Utility. Follow the Install Shield Wizard to uninstall the utility software from your PC. Click Finish when the figure below appears. the adapter from your PC. available for American users to choose. and WEP encryption for security. peer-to-peer basis, communicating directly with each other without the use of an access point. peer-to-peer mode, and is useful at a departmental scale or SOHO operation. signal is recognized as the only valid signal, and interference is inherently rejected (ignored). transmitter and receiver know the hop patterns, interception of FHSS is extremely difficult. scale, or when it is necessary to connect the wired and wireless networks. developed by the military for use in reliable, secure, mission-critical communications systems. not tuned to the right frequency, a spread-spectrum signal looks like background noise. WEP network, you must know the key. The key is a string of characters that you create. determines the key length. 128-bit encryption requires a longer key than 64-bit encryption. you can change keys easily. Integrity Protocol) encryption, which can be used in conjunction with a RADIUS server.